After years of delays, Russia has formally leased to India an advanced nuclear-powered submarine. For India, the move is a further indication of its shift towards the modernization of its naval capabilities. Russia, for its part, will be hoping the signing is a step away from a series of accidents that have haunted its navy for over a decade. “The ceremony to sign the document was held on Thursday at the shipyard in Bolshoi Kamen in the Primorsky Territory, where the Nerpa nuclear submarine is currently deployed,” an official in the Russian Naval Chief of Staff’s office told ITAR-TASS on Friday. The Indian Navy will now operate an “Akula” II nuclear attack submarine for the next ten years per a special lease agreement. The move should prove a boon to the Indian Navy, giving the country the ability to not only utilize the vessel for combat patrols and train in one of the world’s more advanced nuclear submarines, but also apply lessons learned to its own domestic nuclear submarine program. “All of the naval tests and performance checks have been completed,” the Russian official explained. The submarine signing is a welcome piece of good news for the Russian Navy. Russia’s armed forces have routinely been criticized for an alleged lack of focus on safety, especially since the 2000 sinking of the Russian submarine Kursk in 2000. Safety questions were again raised following a recent fire aboard a Russian Delta IV nuclear submarine,which sparked fears of a possible radiation leak. The fire started Thursday at an Arctic shipyard outside the Russian port city of Murmansk where the submarine “Yekaterinburg” was in dry dock. The fire has since been contained, with Russian officials claiming no radioactive contamination as a result of the blaze. Officials have stated the fire beganon wooden scaffolding before going on to engulf the submarine’s outer hull. The Yekaterinburg’s nuclear reactor had been shut down along with its nuclear-tipped missiles and other weaponry having been removed before being placed in dry dock. The Nerpa, rechristened INS Chakra for the Indian Navy, will be the first nuclear powered submarine to be operated by India in twenty years. 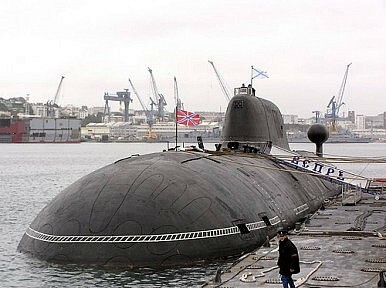 India has previously leased a Russian nuclear submarine, a Charlie II class vessel, from 1988-1991. The transferred submarine itself has a long history that stretches even before her first formal patrol. Construction on the submarine began in 1993, but was stopped due to a lack of funding. The submarine was mothballed until 2004. An agreement was signed that stipulated India would finance the final construction costs of the sub and be completed in 2007. However, the plan was hit by further delays, including an incident on November 8, 2008, when 20 people died after an unauthorized release of fire suppressant gas inside the submarine during a submerged test during the vessel’s sea trials in the Sea of Japan. Reports on the accident suggest crew members died due to the accidental release of Freon R-114B2. India, meanwhile, has also been working on its own nuclear submarine fleet. In 2009, India formally unveiled its Arihant-class nuclear-powered ballistic submarine. The ship is expected to incorporate Russian designs and is expected to have a number of similarities to the Soviet Charlie II submarine it has leased in the past. The Chakra joins a long line of Russian military equipment now operating with the Indian Navy. India has previously purchased 10 Russian designed “Kilo” class diesel submarines and has also bought and financed the modernization of the Cold War-era Soviet aircraft carrier Admiral Gorshkov. Harry Kazianis is assistant editor of The Diplomat. India's Navy Comes of AgeReport: India, Russia Sign $3 Billion Nuclear Attack Submarine DealIndia, Russia To Sign $3 Billion Nuclear Sub Deal This WeekIndia to Lease Another Nuclear Submarine From Russia Will India Lease Another Russian Nuclear Submarine?